Many Broadway shows get their first reviews during an out-of-town tryout. Those reviews can let the creative team know exactly what’s working and what isn’t working. Reviews are also used by folks shopping for service professionals. In the category of junk hauling, you may stumble upon reviews for Junk King Worcester. If the reviews selected here are any indication, then it’s clear this is the best company for any type of junk hauling. Junk King doesn’t like to leave a property and less that owner is totally satisfied. It will be up to you to decide exactly what needs to be carted away. That’s all the Junk King focuses on. A vast majority of Junk King customers are repeat customers. This means two things. First, there’s always more junk to get rid of. Second, Junk King Worcester must be doing something right! It is amazing how many companies get “phone skills” wrong. You’ll never experience that with Junk King Worcester. The crews working for junk King also terrific problem solvers. 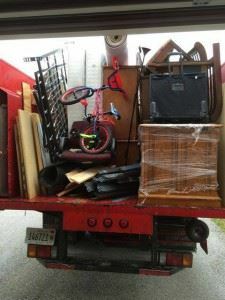 One session with these junk haulers and your home can be completely transformed. Put Junk King Worcester to work around your house today. You won’t be disappointed. This entry was posted in Worcester Junk Removal and tagged Junk King, junk removal, reviews on September 30, 2017 by Junk King. Last updated October 1, 2017 .